» Is Panda Research Legit? – If So Are They Worth Your Time And Effort? Is Panda Research Legit? – If So Are They Worth Your Time And Effort? Today I have another review of a survey site as today I'll be answering the question on whether is Panda Research Legit or not. 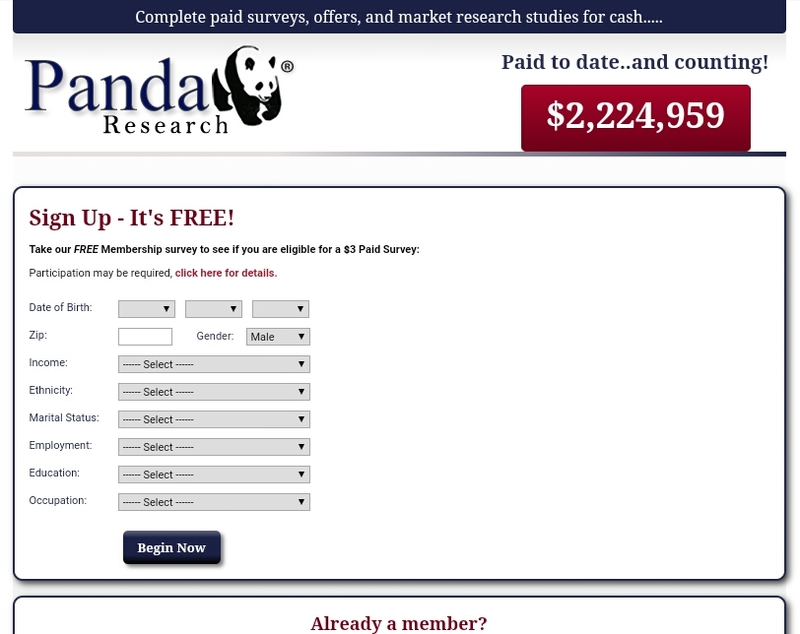 Panda research is a site where you will be paid to fill out and complete surveys. In general surveys are a great way to generate a second income or some extra cash. Panda research is a survey site that claims that they have paid out members for over 10 years ever since 2005. This is an interesting stat as after reviewing the site I'm quite surprised they are still going to this day. I'll explain why that is in just a moment. There are a number of ways users can make money with them, to name a few that is surveys, offers, clicking on emails, cpc, etc. How Much Does It Cost and How Do You Sign Up? As should always be the case you don't need to pay to sign up for Panda Research as its a free panel. As for the sign up process it is straightforward and will take you a few minutes to complete. I have to say though that the site isn't exactly entirely free. If your familiar with offer walls and offers on some survey sites then you may be familiar with paid offers. These require you to make some kind of purchase to complete however these offers do tend to pay well. You will find a number of paid offers available to you at Panda Research. From seeing what other people have to say about Panda Research there seems to be a number of complaints on the payment system. This is a mixture of both confusion and frustration. This is because not everyone knows exactly what the threshold for the minimal withdrawal is. For those of you who are wondering what the threshold is it is $50 which is in my opinion a little to high. There are a number of reward sites that have high thresholds however with these sites it makes it much harder to withdraw and a grind to achieve it. While the threshold for me is problem the next complaint I saw popping up a lot is much worse. Now the other complaint is members not being paid, this was very common with members. From what I've seen it seems to be 50/50, half of which are receiving payments and the other half not seeing any of the earnings. I don't recommend survey sites that have doubts on the payment system has the last thing you want is to dedicate hours only to see nothing in return. With Panda Research I've seen people who have said they have saved up over $150 before trying to cash out and then not seeing any of that cash. There are some receiving there payments but not the majority and even the ones that are are receiving there's months later. In my opinion Panda Research is not worth the hassle and I wouldn't recommend them as a source of extra income. While there are normally a positive or so with a survey site i review with Panda Research there aren't as the idea of completing surveys and earning cash that you may not later recieve isnt appealing. What I'd Recommend Over Panda Research? There are very few survey sites out there that actually pay out and I'm sure you can tell Panda Research is not one of them that do. Out of all the survey sites I've reviewed I've only found a handful that pay well while at the same time offering good opportunities to make a consistent income. To break down that handful further there's only one survey site I've stuck up with over the last 5 years for making an extra $500 a month. That's because the opportunities they offer are consistent and the fact they are established makes them even better. What do you think of Panda Research? Share your thoughts and opinions on them with me in the comments below! Previous Post What Is Contractor Advisory Board – Are They Legitimate Or Not? Next Post What Is Inboxpays Surveys About? A Legitimate Site To Make Extra Cash?